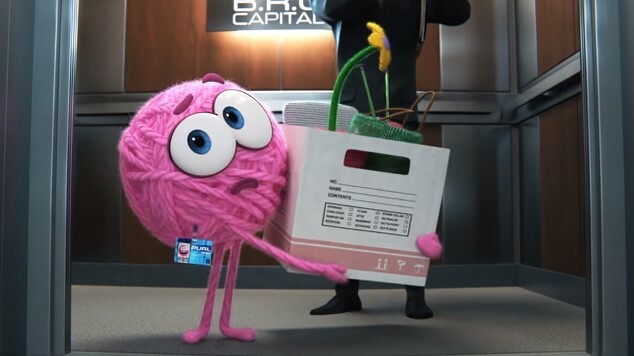 A nice short from Pixar about perceived micro-aggressions. In reality, anyone part of a social node (i.e. “culture”) must conform to the norms of the node else be rejected by the node. In this short the protagonist changes herself to conform to the norm of the node. Humans must cope with the perpetual ontological struggle of being caused to see oneself as an object from the view of another consciousness. The mere presence of another person causes us to look at ourselves as an object and see our world as it appears to the other person. We don’t control our identity. The social node we wish to belong to does. Purl’s original “self” was crafted by the world she was a part of before joining B.R.O. Capital. That made her feel like an outsider. The “self” she embraced was rejected by the node she joined. With the rejection came sadness for rejecting the former norms that made Purl Purl. Once she conformed the pain went away. Then, when seeing a member of her former node she empathized with the new member and didn’t want the new member to feel the pain. Was it empathy or was it shame that she shed the customs of her prior node? In the end, we extrapolate that her behavior towards the new member brought a shift of culture at B.R.O. Capital creating a new culture. What does the short reinforce in the minds of the viewers? That a node’s culture changes with every new non-conforming member added making it better? Or that non-conforming members who join a node are are destroyers of culture? In order for us to answer this we must learn about what impact the change in culture at B.R.O. Capital had on it’s performance. We can try to answer this here but we’ve already spun quite a yarn.